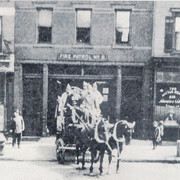 * Note - This picture is from NY Public Library from a post card of the era - noted as "the last call" of volunteer H&L company - firehouse is similar to current E 156 quarters. There are differences (windows, brickwork). This might be former firehouse on Broadway. E156's present house was built in 1908 but there's a story as to why, according to the "Staten Island Fire Centennial" book: There was a 3-alarm fire at the Hotel Castleton on Nov. 12, 1907. In the early evening hours of Nov. 13th, while E206 (156 today) was still operating at the Hotel Castleton, a 3-alarm fire destroyed their quarters. The fire spread to adjoining structures on either side of the firehouse and to a dwelling behind the firehouse. Contemporary reports about the fire's origin are conflicting. Some indicated the fire started from an overheated stove while others report disgruntled former volunteer firemen sneaking into quarters and starting the fire. Anyone have pictures of E 48's old house ? Thanks "mack" for that story. I, along with "Bxboro" are interested in that. I remember when that firehouse was home to Fire Salvage 3 and Engine 48 moved to their new firehouse and became Number ONE for runs in the city. After Fire Salvage 3 closed, I caught a Second Alarm fire in that building. There was also another fire in that building as I remember it before it collapsed. 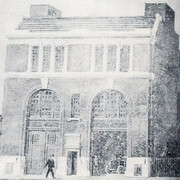 In College Point, Queens, the former quarters of E296 (which was disbanded in 1960) still had the horse stalls within. 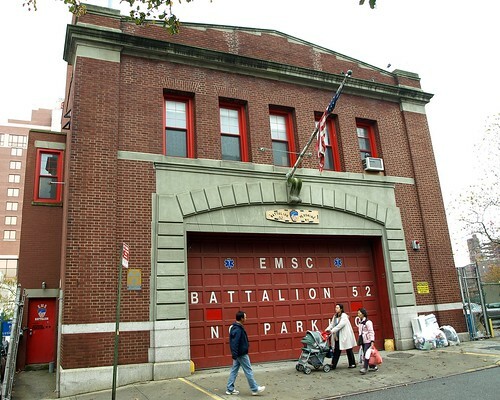 That building was there from the volunteer days in the 1800's, the life span of E296 and then home to the FDNY Communications "linemen" until they moved in the early 70's to the former quarters of the disbanded E272 in Flushing. 296's firehouse was the most rundown place I have ever seen and that was when the engine company was still there. 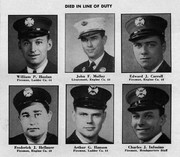 I think Mike from FDNYtrucks.com may still have the picture of the place. If so, I hope he posts it here when he has time. Now there are two or three brick houses jammed into the lot where the firehouse once stood on 125 street between 18th and 20th Avenues. Thanks Mack for the info. I also remember that house when it was sitting there rotting away...what a shame ! After 272/52 the house had Fire Prevention District Office 14 there next it had the QNS Boro Command & EMS Command before they moved to Fort Totten then EMS BN*52 as today. FD Qns.Boro Command came after EMS B52 was already there. They shared the place until QBC moved to Ft.Totten. At one time there were four ambulances running out of there, now it's down to only 1 and their corner is at Roosevelt Ave. & 103 Street in the 46 Bn. Go figure! 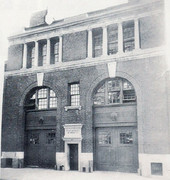 E 296 was formerly located at 18-18 126 Street.